Kim Hyun Joong (24) whose popularity spread to worldwide, just finished shooting for his first leading drama 'Mischievous Kiss' and was taking a break. We met in the interview. Even though his face still looks like Bae Seung Jo in 'Mischievous Kiss', his 4-D charisma is so clear by glancing at him making stars with the yellow rubber band. Kim Hyun Joong's first leading drama "Mischievous Kiss" Special Edition made the premiere through the global video website Youtube. This is a fresh experience for me because it is the first time (to put the Korean drama on YouTube). The YouTube special edition was much better received than I expected, luckily. Comments from fans of the countries, like Tunis and Argentina that I barely get in touch with really surprised me. I can't believe the fact that I have fans in those countries. Kim Hyun Joong said with shy smile. YouTube special edition has set the new records of clicking and comments replies. Kim Hyun Joong replied these compliments humbly "Like some comments (mentioned), i still don't feel the popularity I gain. Maybe I will get the sense of reality when I am able to see fans' reaction in the promotion activity"
Kim Hyun Joong took the main role in his last drama "Boys Over Flowers", but "Mischievous Kiss" is the first time he lead the drama completely. Is there any burdens by taking the leading role? "I don't feel the pressure, this is my characteristic. Because if you are under a lot of pressure, you may not do it well. I prefer playing the drama with relaxed mood. Comparing to the pressure, an easy mind is better for me, so I acted relaxingly". You can't see any clues of weakness or being immature as a junior actor while he talked about his feeling. Under mass expectation, there are two types of reactions to his acting skill "Still immature" and "Improved from the period of BOF". Compared to himself three months ago, Kim Hyun Joong said confidently that he's very satisfied with the Bae Seung Jo role he portrayed. "(I wish) my work will be unique and valuable. I don't want to regret. Also, the role Bae Seung Jo is totally different from the person Kim Hyun Joong, so I worked very hard to show (Bae Seung Jo's) characteristics that are completely different from Kim Hyun Joong. To become Bae Seung Jo, I studied this role. If you see the sign of Kim Hyun Joong from Bae Seung Jo, then the role is still Kim Hyun Joong, not Bae Seung Jo" "I heard a lot of comments like 'improved a lot'. I wishes to hear 'Well done!' on the (current) basis of 'You've Improved'". 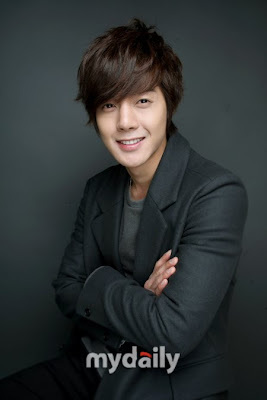 As a Junior actor, Kim Hyun Joong showed his expectations. Recently, many idols originally from idol groups challenged the field of musicals. DBSK's U-know, JYJ's Kim Joon Soo, SS501's Kim Hyung Jun and Park Jung Min, presenting their images besides singers from different ways, but Kim Hyun Joong brought out his own point "Never think about anything else besides acting and singing. Not to say that I don't want to, but I am still not confident enough to handle singing and acting at the same time. I only want to concentrate on acting and singing currently". Kim Hyun Joong's enthusiasm about acting was seen during the hour-long interview. No matter what, Kim Hyun Joong had a strong will to improve his drawback in the acting skill. It's curious about the true look of an ordinary 24-year old youth rather than an entertainer star Kim Hyun Joong. It is well known that Kim Hyun Joong loves soccer among the pop artists. The pictures showing his happy face in the community soccer club are well known from the the 'Soccer Fans' (Is this a magazine? Sorry, I am not quite sure here). Together with private coach and dancers, they rented a sedan and made a trip to YangJu (扬州) for a (soccer) match. Kim Hyun Joong likes to play indoor soccer there. "My position is center forward in the field. I watched all the scoor games in the Asian Game", Kim Hyun Joong said his most favorite player was Park Ji-Sung. "He's really the best soccer player of Asia. It is very exciting watching his game. He's very hard-working. The nick name 'oxygen tank' fits him perfectly." You can see his boyish look while chatting about soccer. Kim Hyun Joong also talked about his daily life honestly "(I) like to eat chicken and drink Soju with friends in Seoul's suburb like Nam Yang Ju. Play Soccer or Go-Stop game to kill the time while waiting for meal" "Having a day like this, my exhausted heart and body are recharged. Though not able to spend days like this a lot, (I'd) love to go whenever I have time". 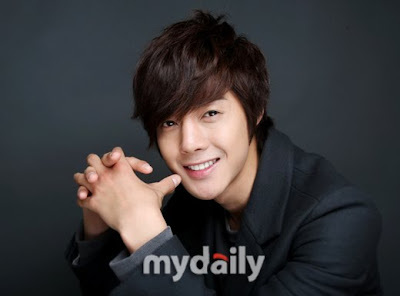 Kim Hyun Joong said, bursting into a big smile. Drama 'Mischeivous Kiss' leading by Kim Hyun Joong has been sold to many Asian countries before its TV broadcasting, which gained a lot of popularity in China, Japan, Taiwan and many other countries. Kim Hyun Joong is going to Taiwan for the 'Mischievous Kiss' promotion activity in the coming December 26th. There are only 2 months left in 2010, compared to the domestic market, actor Kim Hyun Joong will gained a more solid ground overseas where he stays for a long time.